An important lesson all children must learn is the importance of serving others. To be of service to someone else is one of the greatest gifts anyone — adult or child — can give. By helping your students learn this lesson, you will be doing them a great service. 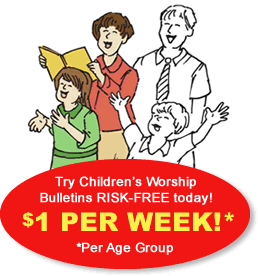 Let Children's Worship Bulletins help with your Sunday school activities about serving. Our bulletins help you share this message through puzzles, mazes, word pictures and more. By making learning fun and entertaining, you will keep your students excited about learning Scripture. With more bulletins to select from than anywhere else, you will never run out of ideas for your Sunday school classroom. You can use our bulletins to inspire group activities for your classroom, too. Below is an example of using our Children's Worship Bulletins about serving others to inspire a group activity. Print out the desired bulletin and the answer key. Have students work together in groups of two or three. Give the directions, "Use the groups of letters to complete the verse. Keep in mind, they may fit within a word or be shared between two words. Raise your hand when you are finished. If there are no questions, you may start." The first group to complete the exercise is the winner and will get small prizes. When all groups are finished, review the answers with the class. Talk with the class about how God gave each of us gifts to use to serve others. Ask them how they can serve, what gifts they have to share, and how serving makes them feel. Encourage them to do a secret act of service for someone this week where they get no praise for it, and have them report back next Sunday about what they did. Send a bulletin home with each child for them to complete this week as a reinforcement of what they learned in class.